Over the years, and through multiple new phones, many games have come and went from the home screen of my phone. Some lasted mere minutes or hours, and some have lasted months. However, there is one game that has managed to stay firmly placed on my iPhone home screen for nearly five years. That game my friends, is Ridiculous Fishing. To me, it’s the perfect mobile game. Ridiculous Fishing has a very simple premise. Cast your lure into the depths of the ocean to reach as far down as your lure goes while avoiding all manners of sea creatures on the way down. This is done by tilting your device left or right. Once you’ve reached the bottom, you must recall your rod while capturing as many of those creatures as you can along the way. Once that’s done you launch all those poor creatures into the sky and use your vast array of weapons to blow them to kingdom come. For cash purposes of course. Sounds simple, right? That’s because it is. 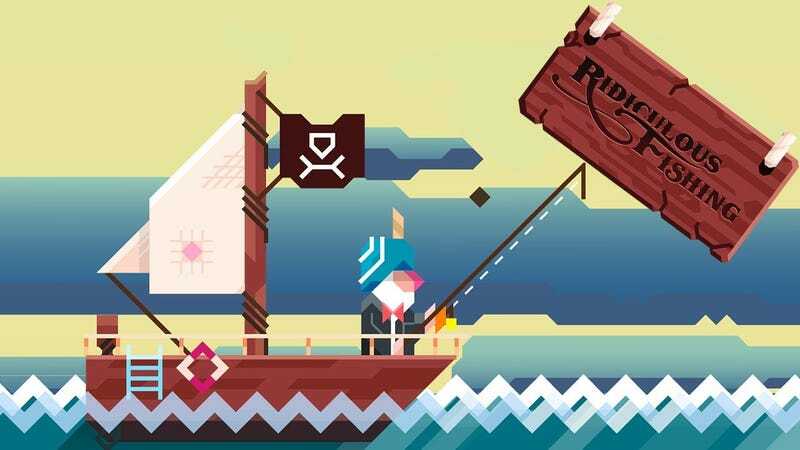 Mobile devices are suited perfectly for those simple, play for five minute games, and Ridiculous Fishing is the perfect example. The games simple yet addictive gameplay is backed up by the games wonderful charm. The challenge comes from getting your lure as deep into the ocean as possible. While that challenge starts of easy, it gets more difficult the deeper you go due to the increasing numbers of aquatic creatures along the way. If your lure collides with an animal prematurely the lure will retreat immediately. Luckily, this still gives you a chance to capture some creatures along the way and still make some money from your failure. As you get further along in the game it only becomes more addicting. The real challenge comes from telling yourself to have one more go in order to reach even further down than last time. Or you could be like me, and reach your record depth many moons ago and spend the rest of your days trying to recreate that glorious moment. It looks fantastic on mobile too. It’s bright and colourful, which helps it stand out from the crowd. The simplistic and cartoony graphics are perfect for this kind of game on a small mobile device. Something that puts me off many mobile games is there need to have roughly 78 billion things on the screen at once. Sure you can end up have dozens of little creatures on your screen at once, but their simple and cute designs mean your screen doesn’t feel cluttered. As you earn money, you can purchase a wide range of upgrades and cosmetics that will help you along your way. Want a new gun? Buy it. Want to go even further down into the ocean and maybe even reach the sea floor? Buy a longer reel. Want another chance if you mess up? Buy a...toaster. Some of the upgrades and weapons are truly ridiculous(Because the games called Ridiculous Fishing, get it?). There are some cosmetics that provide absolutely no benefit whatsoever. Unless you count looking fly as hell in your Tuxedo as a benefit. As you get further into the game, the upgrades obviously become more expensive, requiring you to go to deeper oceans in order to hunt larger and rarer sea dwellers. Unfortunately the biggest flaw of Ridiculous Fishing is that all of the upgrades could probably be acquired within a few hours of playing. Luckily enough this game plays best as something you open up and play for a few minutes at a time whether you’re waiting for a bus or an appointment. This helps negate the one major downside of this game. Reminiscent of the music from the 8-bit and 16-bit eras, the music is ridiculously catchy. I get serious Pokémon Gold/Silver vibes from the track above. Something neat about the music is that whenever you’re reeling your catch in it plays the track backwards. It’s something that wasn’t necessary but I think adds charm to the overall experience. Of course there are hundreds of fantastic games out there available for iOS and Android, but Ridiculous Fishing is the one that has provided me with hours of fun and will absolutely continue to for years to come. Plus, this game has one of the most surprisingly poignant endings I’ve encountered. Something I wasn’t expecting at all. This game truly does deserve its namesake.